Time to switch up your potato game. • and guaranteed to FILL YOU UP. Make in advance and freeze for later. 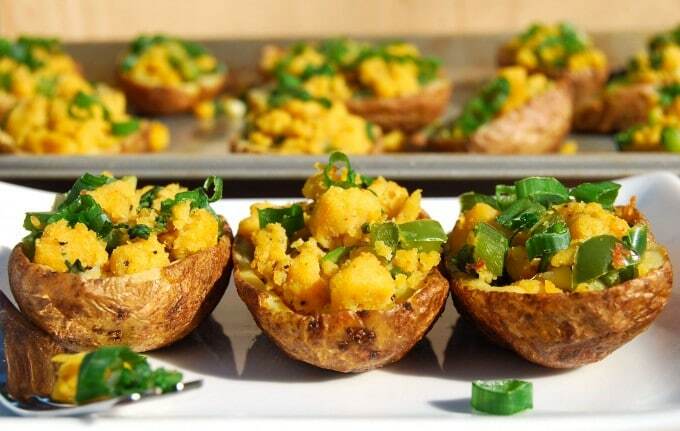 These taters reheat exceptionally well and can be devoured as a meal by itself or as a super hearty side dish (just nix the protein element!). Each recipe is for 2 WHOLE potatoes (4 servings – 1⁄2 potato per person). Pre-heat oven to 375 degrees. Halve your cooked baked potatoes length-wise, scoop out cooked potato (save skins) and place in mixing bowl. Put skins on a baking sheet. To the mixing bowl with your potato, add 1⁄4 cup Greek yogurt, cooked ground turkey, and half of the feta cheese. Mix thoroughly until potato texture is smooth (chunks of feta is A-OK!) and scoop back into potato skins. Place foil over baking sheet and bake for 10 minutes. Meanwhile, in a separate bowl, combine remainder of Greek yogurt, feta, cucumbers, lemon juice, pepper, and garlic. When potatoes are out of oven, spoon yogurt/cucumber/feta mixture over the top, garnish with black olives. Don’t feel fooled by the randomness of the ingredients! This sweet and savory concoction will leave you satisfied! Cut each sweet potato in half length-wise and scoop out insides. Place in separate mixing bowl. Place skins on baking sheet and pre-heat oven to 350 degrees. Take potato insides and add maple syrup, cinnamon, peanut butter, and sliced chicken. Stir until combined. 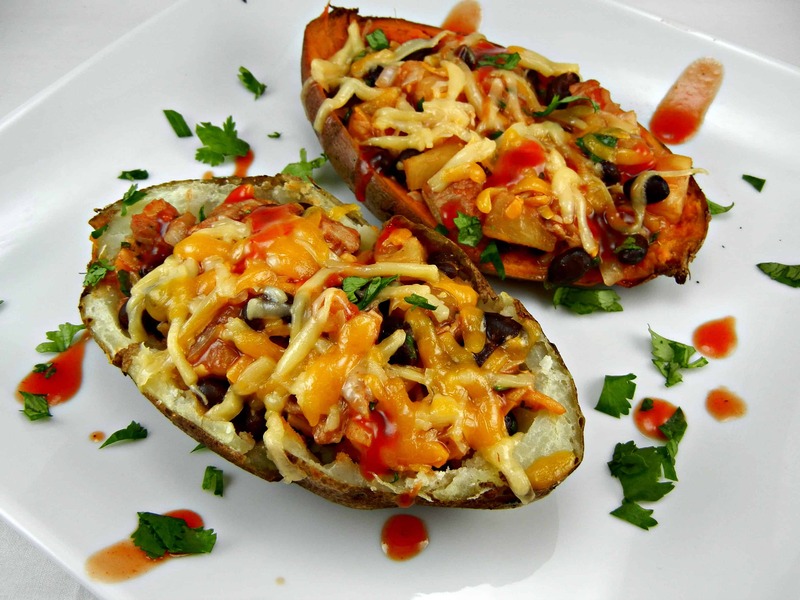 Scoop into potato skins and bake for 8 minutes. Switch oven to broil mode at 500 degrees. Sprinkle marshmallows over top and place under broiler until marshmallows brown. Sprinkle some more cinnamon over top and devour! It’s like Thanksgiving without the added butter! **You can add sliced pecans to the mix if you desire! Scoop out cooked potatoes leaving just the skin. Place skins on baking sheet and filling in a mixing bowl. Preheat oven to 400 degrees. In the mixing bowl, add milk, salt, pepper, and 1⁄2 the cheese. Then add black beans, ground beef, and corn. Mix well! Scoop back into the skins, sprinkle on remainder of cheese over the tops. Bake until cheese is completely melted. Top with sour cream, tomatoes, and green onions.